Question 1: A player’s ball lies on a sprinkler head. May they take relief from it without penalty? Note that the nearest point of relief for a right-handed player in the photo above is a just off the right hand side of the sprinkler head, even though the player’s stance would be behind it. In other words, they would be standing over the sprinkler head to make their stroke. Once this nearest point has been decided the player may then drop the ball within one club-length of this point, not nearer the hole. This means that the ball could then be dropped on either side of the sprinkler head. If the ball comes to rest in a position in which there is still interference from the sprinkler head, or nearer the hole, then it must be re-dropped. 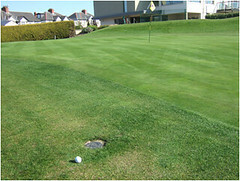 Question 2: A right-handed player’s ball lies in a place where they would have to stand on the flat sprinkler head in order to play their stroke. May they take relief from the sprinkler head without penalty? Answer: Yes, a player may take relief without penalty from an immovable obstruction when it interferes with their stance or area of their intended swing, Rule 24-2a. 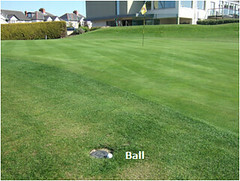 Question 3: A left-handed player’s ball lies in a place where they say there is mental interference from a flat sprinkler head (as in the second photo above), which is affecting the way that they would like to play their stroke. May they take relief from the sprinkler head without penalty? Answer: No, there is no relief without penalty for mental interference from an immovable obstruction. Decision 24-2a/1. Question 4: A player’s ball lies on the apron of the putting green and there is a sprinkler head on their intended line of putt. May they take relief from the sprinkler head? Answer: No, Rule 24-2 states that, except on the putting green, intervention on the line of play is not, of itself, interference under this Rule.